Highly sought after quality double thickness roll pin webbing belt from Vanguard. Ideal as a fieldcraft belt. Features fully adjustable quick release roll pin with webbing tab. Weight: 240g. Colour: MTP green. Sam Browne Belt. Official MOD issue, Mens version. New & unissued. Most Sizes. Size XL. This is maroon and yellow in colour, it looks a bit darker in the photos than in real life. It measures 42" in its current position with approx 6" spare overlap to be made larger or it could be made smaller. Genuine British Army Red With Blue Yellow Stripes Double Buckle Stable Belt 38"
For Sale: A Foot Guards Officer's Sword belt with sword slings as worn under neath the sash on either the red tunic or frock coat. In good used condition with one long sling and one slightly smaller sling and with brass hook. THE CHORD COULD BENEFIT WASHING BUT IN GOOD CONDITION. A lovely condition British Army Combined Services Stable Belt - complete with both its original leather buckles. For Sale: A British Army Infantry Officer's ceremonial crimson sash. A ROYAL MILITARY ACADEMY, SANDHURST CADET'S UNIFORM BELT BUCKLE IN BRASS WITH A STAYBRITE ANODISED ALUMINIUM BADGE. OWING TO RECENT PROBLEMS I DO NOT ACCEPT CHEQUES NOR DO I GIVE OUT MY BANK DETAILS. Royal Marines Commando's Elite Special Boat Service (SBS). Green/Blue/Black Cotton SBS Ceremonial/Parade Dress Jacket Lanyard. Special Boat Service (SBS). Ideal For All Serious Collectors Of The Royal Marines Commando's. 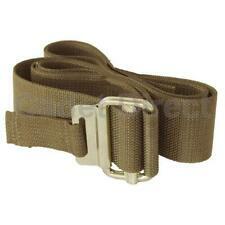 british forces issue belt, olive green, heavy duty nylon type. Condition is Used, fraying is from attempt to make tapered for smartness as per old plastic type! Dispatched with Royal Mail 2nd Class. Rest of the world (From £12.70). RIFLES REGT SJT CROSS BELT SILVER PLATED BADGE. 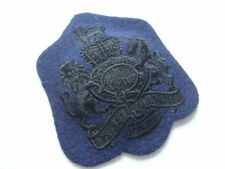 SMALL SJT TYPE (LARGE WO2 ALSO LISTED ). Genuine British Army 2" RED with BLUE Stripe Double Buckle Stable Belt 40"